Sometimes I don’t agree with the title of this post. Twenty minutes late for a half-hour class and I’ll just not bother. Incidentally we stopped going to Mommy and Me Dance because I was so late way too often. However, in this instance late is better than never. We had so much fun, and the results were gorgeous! I’m talking about dyeing our Easter eggs. This year we planned to use organic chicken eggs, courtesy of my parents farm. 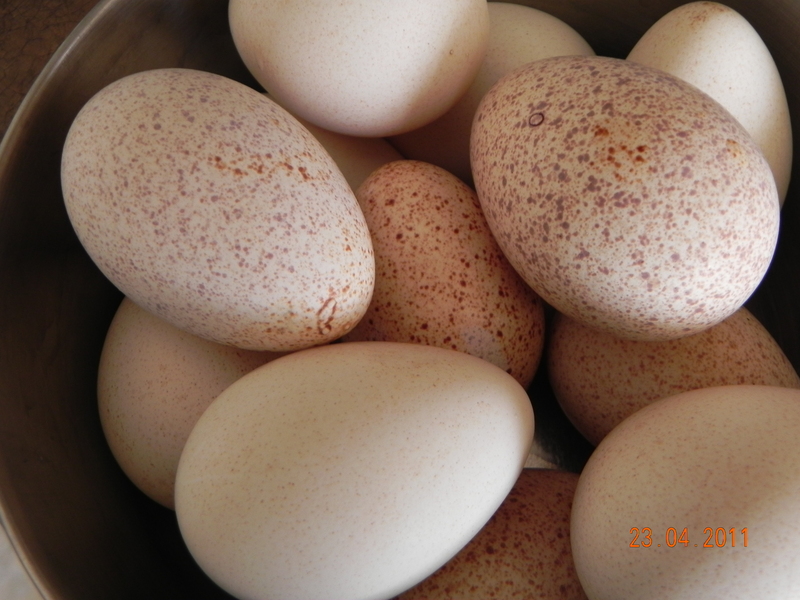 Of course my parents eggs are mostly brown, but I was so excited to discover spectacular speckled eggs amongst all those brown ones. They were perfect. I asked the girls what colours they wanted, then we went through the kitchen to find different items that might produce the desired hue. 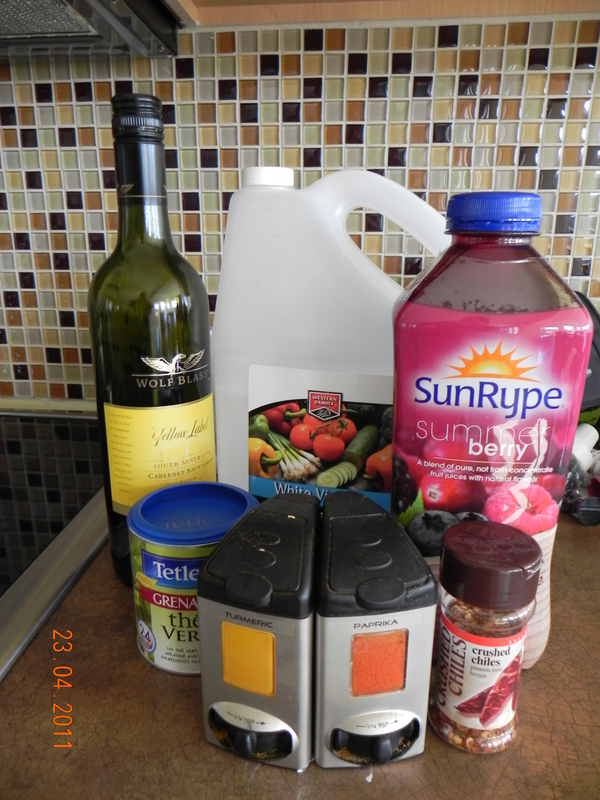 We used the last bit of red wine in a bottle, turmeric, fruit juice blend, cranberry juice, paprika, green tea, and crushed chilies. The juice blend didn’t work, and even though I’ve heard good things about using chilies, I personally wouldn’t use them again. Most sites I looked up said to boil the eggs with the item being used to colour the eggs. I didn’t want to do that, I wanted the girls to be able to safely take the eggs in and out of the liquid to check the colour as they saw fit. So I boiled the water for the tea and let it steep and cool for a few minutes, I boiled the turmeric and paprika for a few minutes to get the colour into the water, then I poured that into cups, the juices and wine I poured into cups as they were. 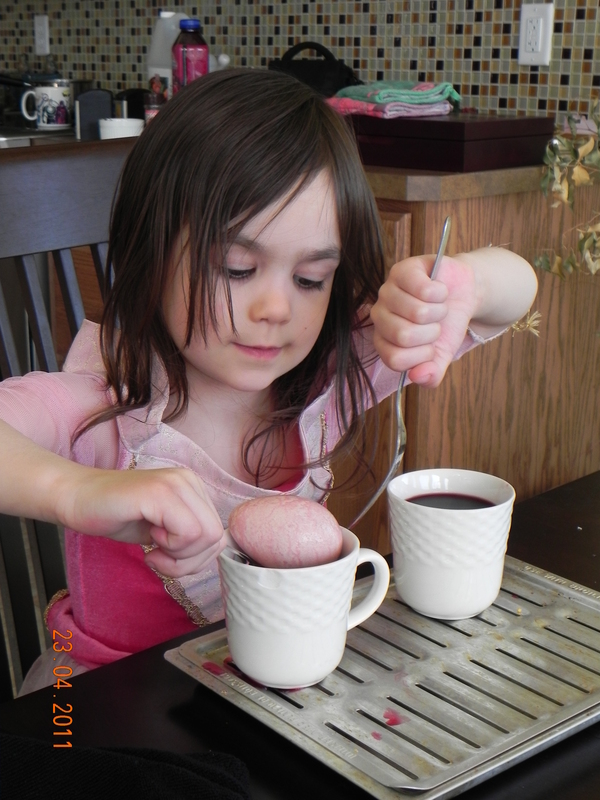 I added one to two teaspoons of white vinegar to each cup and brought it all to the table for the girls. I loved the way the colours turned out. The wine left one egg a deep, deep purple. The other was green with black stripes, the striped one was left for only about five minutes, the other for about twenty (in the fridge). The turmeric left the eggs a vivid orange, the paprika turned them yellow, cranberry juice turned the eggs a rosy pink, and the green tea left the eggs a beautiful yellow-green. 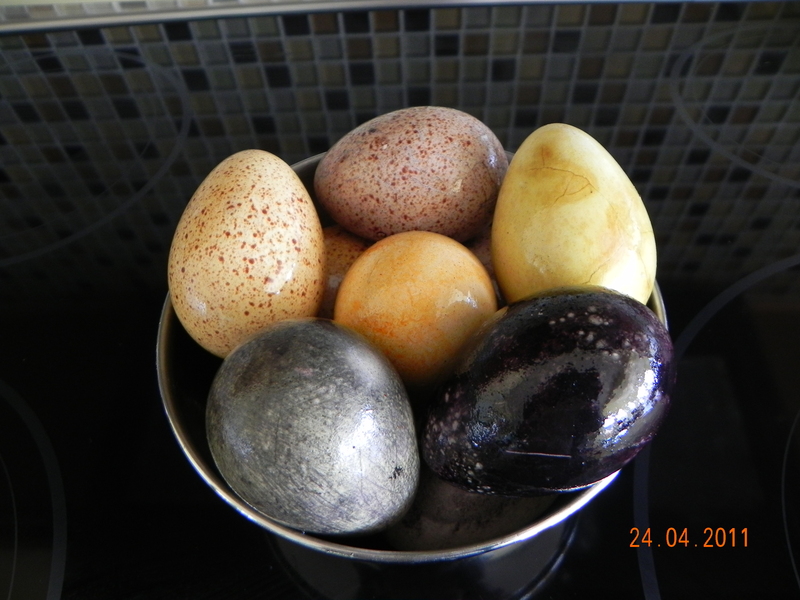 These were the most beautiful eggs we’ve ever dyed, and no one was stained florescent pink or blue for weeks on end. 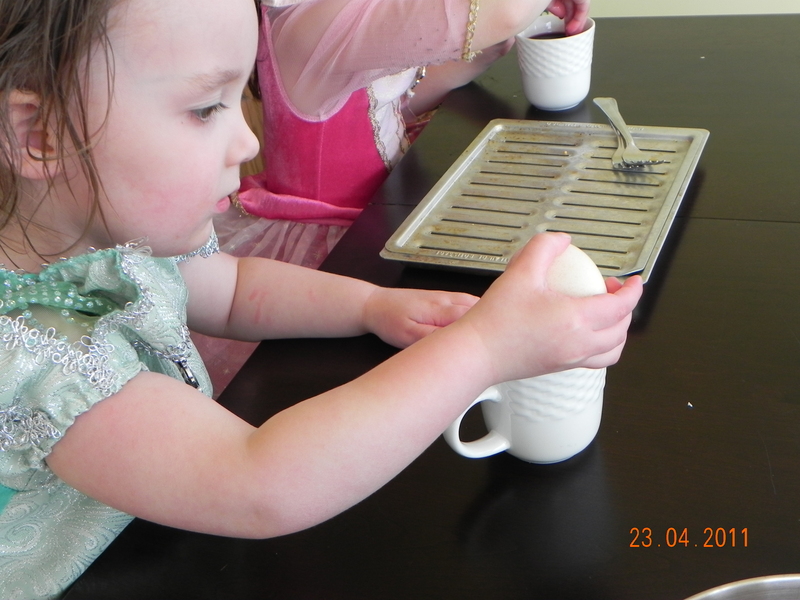 there also wasn’t any concern with eating the eggs after, even if the dye did leak through in a couple places. 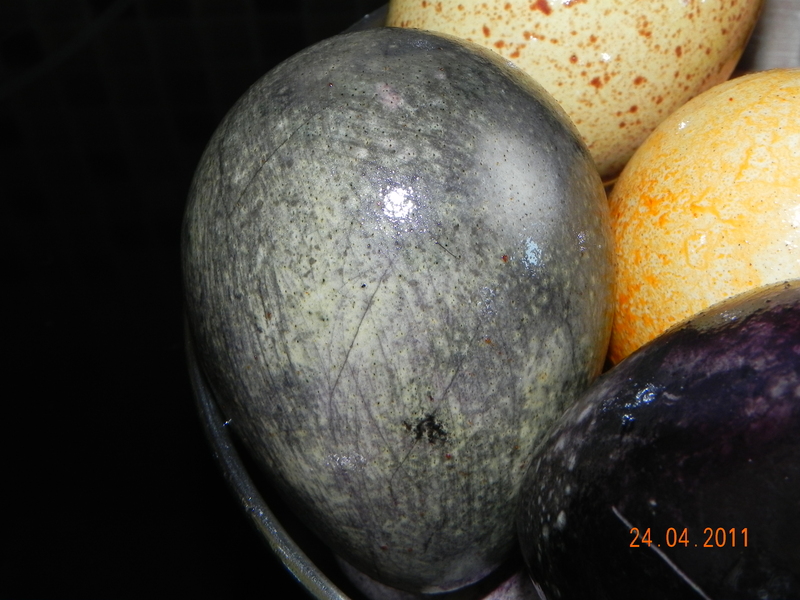 When I called my mom to tell her about our spectacularly, speckled dyed eggs, she got very quiet. Asked if we’d eaten any of them yet, then said she knew something about the eggs and she wasn’t sure if she should tell me or not. I insisted. With a lead up like that either I had to throw out our gorgeous eggs, or know what she was talking about. It turns out there had been a mix up on the farm during egg collection and two dozen turkey eggs went missing. She couldn’t figure out who had them and didn’t want to say anything in case someone got upset. 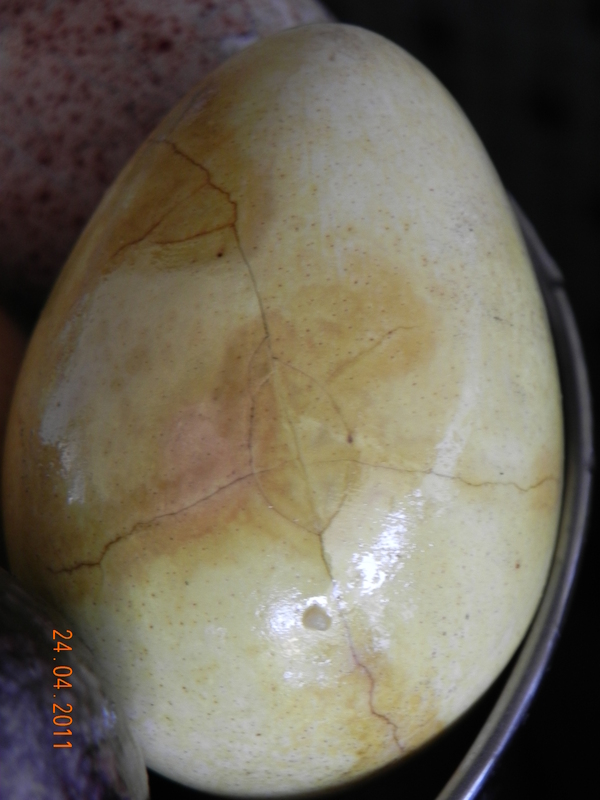 In case you’re wondering turkey eggs really don’t taste that different from a chicken egg (I couldn’t tell the difference at all), bu they are a different shape, and once the turkeys are mature their eggs will be larger. The eggs we received were about the size of a large chicken egg so I couldn’t tell the difference based on size. And not knowing the first thing about chickens, or eggs (other than how to cook both), it didn’t occur to me that we received anything other than chicken eggs. But wow, what cool eggs they are! Thanks! We also made homemade dye for homemade playdough. The girls loved ripping up rose petals.